Photo Reflection of the Day #263: Do You Want Fries With That Railing? A receipt randomly taped to a railing in a stairway. Some photos jump out at you. 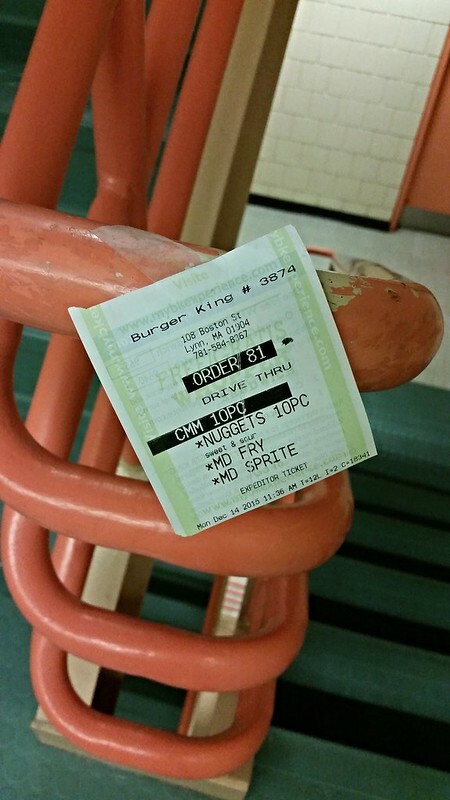 In this case, a Burger King receipt taped to a railing in a hallway at the college caught my eye. It seemed the most random place to appear given that a Burger King is at about a half mile away and this particular staircase is half-way into the building. I would have expected it near the entrance, but on the second-floor landing in the middle of the college seems like a strange place for such a receipt to show up. However, I also liked the randomness of it and it's place upon the railing--not on the floor or the wall, but somewhere it could not be ignored; rather some place that people had to interact with it. That is, it was a clear placing and I wonder what the person thought as he or she did it. Was it to amuse or to pester? Was it a sign of frustration or a sign of disregard?